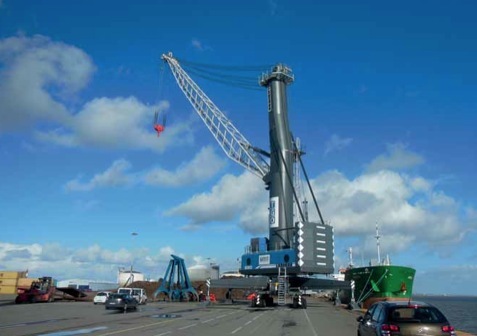 Located at the French Atlantic coast,Terminal du Grand Ouest (TGO) has opted for its first Liebherr mobile harbour crane (LHM), type LHM 550. TGO is the single container and breakbulk terminal operator at Montoir de Bretagne/Saint-Nazaire. Moreover, the company also specializes in scrap metal handling. Due to increasing business, additional crane capacity was required. TGO offers multiple services and demanded a versatile machine. Consequently, a mobile harbour crane was the best solution for the terminal as it can be used for safe general cargo operation and efficient scrap, bulk or container handling — just by an easy exchange of the lifting attachment. “The LHM 550 helps us to develop our heavy-lift cargo handling and scrap metal business, especially in terms of loading heavier parts and larger vessels. The crane offers a lifting capacity up to 144 tonnes, which is unique in this region,” says Ilyasse Aksil, CEO of TGO. Manufactured and pre-tested at Liebherr’s production site in Rostock, the mobile harbour crane arrived in January 2014. The LHM 550 has demonstrated its capabilities right from the start. The first jobs included some impressive lifts, loading a sterilization chamber onto a vessel. Destined for Vera Cruz in Mexico, the chamber came in four pieces, each weighing 91 tonnes. Thanks to the remarkable lifting capacity of the new crane, these parts were loaded directly to the vessel, saving costs and emissions. “We are optimistic that this investment in advanced port equipment will also attract new customers, since we have expanded our service portfolio while maintaining the high quality standards TGO stands for,” adds Aksil. Although the LHM 550 is the first for TGO, Liebherr has delivered to Montoir de Bretagne in France before. In 2012, Liebherr Maritime Cranes delivered its 1000th mobile harbour crane to the Atlantic coast. The LPS 550 was ordered by Montoir Bulk Terminal and is configured for highly efficient bulk handling.